An interesting and thoughtful and thought provoking post from Erika. Her conclusions are sound, in particular that it didn’t offer an answer, but at least it offered hope. I am wondering whether my more recent backing off from shouting about the lack an inclusive church and injustice for a quieter more thoughtful approach has done me some good. Sure I am still desperately sad that we can go on treating people so badly, but my engagement has been more offline with one to one discussions with people, who feel unsure of what to believe, to understand or to think about LGBT issues, I’m not trying to convert them to a cause, just asking them to read some of the literature and perhaps pray for those in difficulties on the whole issue. I can hope and pray for change, but I have concluded that I need to be aware of who I am talking with about these issues. I don’t want or need to cause alarm or anxiety to others by being loud and militant, Now I would rather work, quietly and gently to try to help others to make their own decisions when they’re ready for change. Thank you for this article, Erika. I find it quite inspiring and I realise I’ve been inclined to throw up my hands in despair when I think of the Church of England HQ (a rather shadowy centre to my mind, looking on from the periphery) – your reflections remind me that silence serves the status quo. Reading it I had a vision, naive perhaps, of people with differing views climbing down from their heads and doing something practical together like cooking meals or doing domestic tasks but not remaining silent on ‘delicate’ or personal issues – that would be suffocating. In many cases prejudices of various kinds have not been able to survive spending a lot of time with people who are unapologetically and unhiddenly themselves – atheists, Africans, wheelchair users, Muslims, homosexualists – the list is endless – and well-argued and well-evidenced beliefs about them just crumble. I may live to regret this comment but here goes. Well said, Erika. I took to heart your words about prejudicial prejudging. Rosie Harper In the end the power of the evening was probably in what was not said. There was fear and sadness and weighty and painful stories not articulated. The debate was well worth doing, and my hopeful self thinks there is an underground tide which will tip us all into equality. My less hopeful self feels there is an other tide which has made the CofE much less safe and might end up with a lot of us wondering how we can stay. Erika Baker I agree, Rosie, and my hope rests in the comment Chris Fewings made on Changing Attitude today, stressing that this is NOT an lgbt issue but a credibility issue that affects all Anglicans who want to see a different church. It’s become too broad to be ignored, unless the CoE is genuinely on a suicide trip. Colin Coward Yours is a good refectiom of the evening, Erika, and you remember and report comments that I hadn’t noted. There’s one person we’ve both failed to name and that is Christopher Landau who chaired the evening. I met Christopher regularly when he was a reporter with the BBC and hadn’t met him since his ordination. I thought he chaired remarkably well and halted over long questions and answers by saying ‘Thank you’ firmly and quietly, which he’d said he’d do at the beginning. It worked and contained those prone to length. Laura Sykes If no one objects, I would like to copy these comments to the Lay Anglicana blog – it is all important and it is one way of keeping it all together. If anyone does *not* want their remarks archived for posterity, please just say so. Erika Baker Thank you Colin, I definitely should have mentioned Christopher. Ernie Feasey Have commented on the blog. I think I agree with Rosie. My hopeful…..and less hopeful……..I don’t think a united C of E will be the outcome. One of my concerns is to seek to provide a space to those who want to be open, supportive, loving and inclusive to be so. After my recent blogs I know how scared some people are being made to feel. OK, I’ll be “not nice” then. 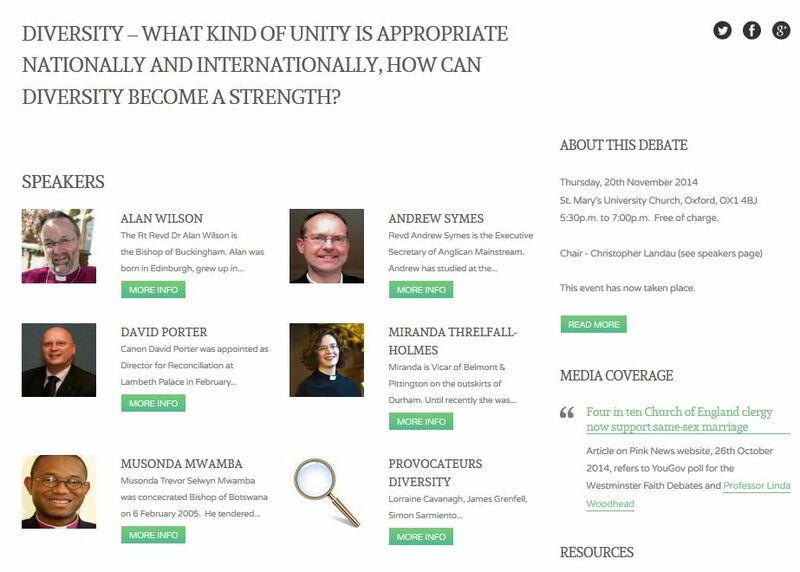 I think Andrew Syme’s ( http://anglicanmainstream.org/oxford-faith-debate-tragic-drama-at-st-marys/ ) self-serving/self-sanctifying line (of “orthodoxy”) drawing is absolutely SINFUL: is anyone going to tell him so? I’m all for “Log/Splinter” humility, but not when it gets in the way of (another Gospel mandate), “Let your yes be ‘Yes” and your no be ‘No'”. Hi ‘tgflux’ – erm, I wonder why you don’t tell him yourself how you feel? I was wondering whether to quote the log/splinter bit back to you (I expect you, like the rest of us, are also a sinner?) but am also pondering whether this would conflict with your support of ‘let your yes be yes’. No, I don’t think it does – you seem pretty certain of the difference between yes and no. I try to maintain (pretty successfully since I usually delete exceptions) a ‘no ad hominem’ rule. If you want to attack the line Andrew Symes is taking, please attack the points that he makes, item by item. Calling him sinful doesn’t advance the argument. Think what Plato and Socrates would have made of your comment? Tgflux, having read Andrew’s blog post I think he’s very much aware that many of consider his views (not him!) to be harmful, and yes, Christians often use ‘sinful’ instead. We’re in a polarised church where the majority no longer thinks like Andrew but where policy and public statements are still conservative and harmful. I want to change that. And I believe that, while the debate often takes place between passionate and opinionated people on both sides, it is listened to by those in the middle who will eventually collectively change the CoE. When I talk about lgbt equality I am most mindful of the undecides. And I believe that most people are open to robust arguments but not to what they perceive to be insults. Also, Andrew is actually a really nice man. He just happens to be desperately wrong on this issue. I’d rather engage with him in a way that may, just may be constructive than give in to my feelings. Keep your eye on the prize and on the strategy of getting there. Robust criticism – yes. Anything more is human and understandable but counterproductive.